Whether you maintain a few apartment buildings, a hospital, or a school, there are some tools that should be stocked in all maintenance departments! This list will help you keep your facilities in perfect working order, safeguard against emergency situations, and more! Find out what makes these tools great to have on hand at any facility by learning about their ability and features below! Does the building you manage have doors? We thought so. Chances are, some of those doors have hinges that can benefit from being realigned. 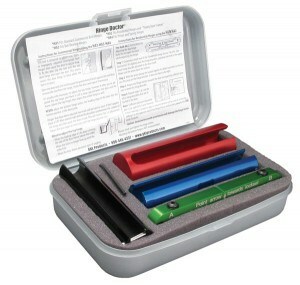 The Hinge Doctor is a hinge restoration tool, designed to adjust new, worn, and improperly adjusted hinges. If a door in your building is sagging or dragging, it’s due to an issue with the hinge. Left flawed, the hinge will wear faster, and cause damage to the door and the floor underneath the door, while also making the door difficult to open and close. This Hinge Doctor kit includes sizes for both residential and commercial doors, so you’ll be ready to tackle almost any door. Repairs with the Hinge Doctor are quick and easy, allowing you to fix sagging doors in just fifteen seconds! Get the Hinge Doctor Complete Tool Kit and never have hinge issues at the buildings you manage again! The Angle Stop Combo Wrench is a new product at Equiparts that we are very excited to have in stock! This multi-purpose tool is perfect for use on angle AND straight stops! The grip is cushioned, and the wrench is adjustable up to ½”. It has a reversible jaw for an extra wide grip and comes with removable caps to protect surfaces and prevent marring on objects with plated finishes. This wrench makes installing angle and straight stops a snap! It’s a must have tool for any plumbing maintenance personnel. 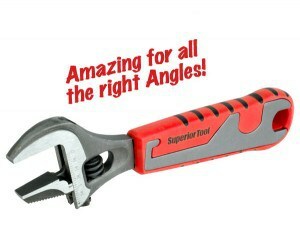 Get the Angle Stop Combo Wrench and make all of your angle and straight stop repairs with one great tool! Insta-Clamps enable facility managers and maintenance personnel to stop leaks at the solder joints on pipes quickly and easily. With the Insta-Clamp Emergency Kit, the building you manage will never need to have an emergency shut down due to a burst pipe. You can take control of the situation by providing a fast, temporary fix, and scheduling a permanent repair at the most convenient time for you and/or the facility. Having an Insta-Clamp kit on hand is a no-brainer for maintenance professionals. There is no single clamp that is versatile enough to fit all settings, which is why having the complete kit is ideal. This kit includes one size of each Insta-Clamp™ from 1/2″ to 2″. The Insta-Clamps can repair couplings, 45s, 90s, tees, and joints. Pick up the Insta-Clamp Emergency Kit today! The Offset Non-Marking Pipe Wrench is another must have tool that we carry at Equiparts. It enables you to get to those hard-to-reach places where nuts tend to reside. This tool has a hex jaw design, which gives you a multi-sided, secure grip on all hex nuts, square nuts, unions and valve packing nuts. This Offset Pipe Wrench is non-marking, so you don’t have to worry about damaging or marking the object you are gripping, unlike wrenches with teeth that mark-up brass and remove chrome finish. The jaw is thin and smooth, so it is able to fit into the tightest of places. The wrench jaw opens to a max width of 2-⅝”, and can hold nuts up to 1½”. Get the Offset Non-Marking Pipe Wrench today, and have the tool you need for tough to reach repairs. We stock tons of unique and specific tools for almost every application at Equiparts, and we are even better known for our wide selection of repair parts. Browse through our product categories, or give one of our parts specialists a call. Order one or all of our tools listed above, or inquire about a tool or part you’ve been looking for by calling us at 800-442-6622 Monday-Friday, 7:30 AM-5:00 PM.